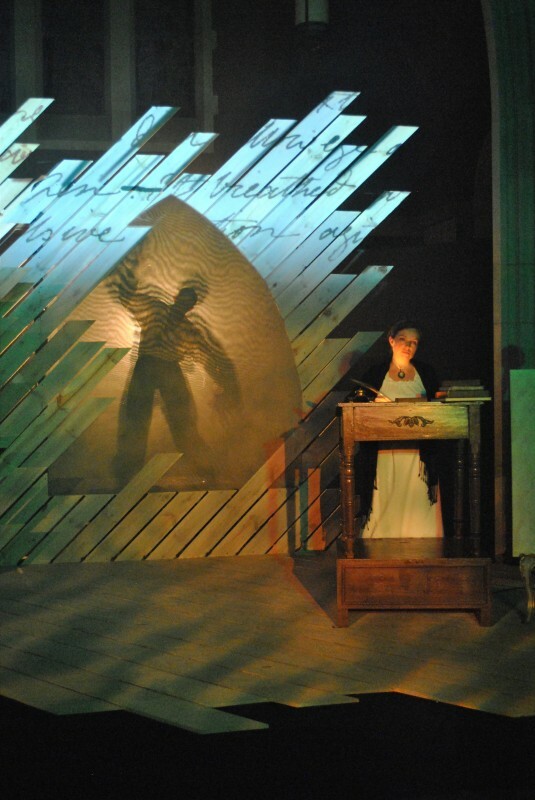 As their Season of the Monster closes with an original script, “Mary Shelley Monster Show,” Mother Nature added special effects on opening night at SATE as Shelley and her famous creation- Frankenstein’s Monster- conversed while thunder rattled and lightning shone through the stained glass windows of The Chapel. It made for an exciting night as the one-hour one act covered Mary Shelley, her famous husband and the crowd she ran around with as Rachel Tibbetts plays Mary and the versatile Ellie Schwetye plays everyone else. 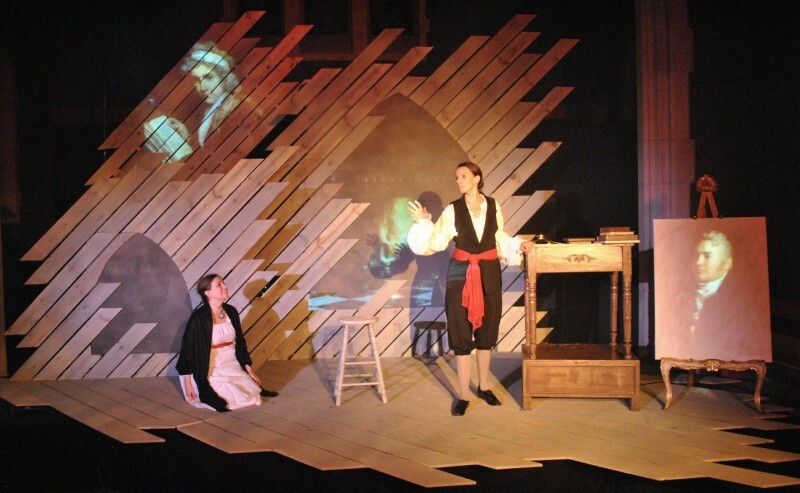 This was a concept that Tibbetts and Schwetye had been working on for some time and playwright Nick Otten brought it all together giving us glimpses into the unusual world of both Mary and her famous husband, poet Percy Bysshe Shelley. Hanging out with a gang headed up most notably by another poet, Lord Byron, rumors spread about their supposed risqué behavior while Mary says their most ardent pursuits centered on their famous ghost story contests which eventually resulted in her penning “Frankenstein: or The Modern Prometheus” in 1818. “Mary Shelley Monster Show” centers a lot on her continuing intellectual conversations with her creation as she is often surprised by what her imaginary visitor knows and how well he read her innermost thoughts. She had created her monster with an eye on such works that impressed her as Milton’s “Paradise Lost” and Coleridge’s “The Rime Of the Ancient Mariner.” In her novel, her creation even reads works by Goethe and others- which made him a well-rounded monster so she should not have been surprised at his knowledge and ability to share cognitive thought. Mary frequently surprised her famous and not-so-famous contemporaries by her knowledge and depth. Pithy comments such as “a bad translation is worse than bad judgement” never failed to impress her fellow writers and, of course, her monster friend. She also shared frequent conversations with her late mother who she lost when she was only eleven days old. This tragedy also haunted her throughout her life as she felt she was responsible for killing her mother through her own birth. Rachel Tibbetts is amazing as Mary. Her levels of emotion bring out the roller coaster of feelings she had in everyday life and even in her most quiet moments with her mother and monster conversations. As the monster, Percy, Lord Byron, Mary’s friend and rival, Claire Clairmont, Mary’s mother and a host of others, Ellie Schwetye is remarkable in her versatility. Passing backstage into one exit and immediately entering with just a slight change- a scarf, a shawl, a waistband- she immediately becomes another character. Even onstage changes occasionally occur with just a turn, a slumped shoulder or a stoop at the waist. Her “monster” appears through a scrim backed up by a rear-projecting light that gives her an odd shape and size that she further distorts through body movement. It’s quite a performance. The third, offstage, party is the powerful, booming voice of Carl Overly, Jr. As a portrait painter and interviewer of Mary, he is a striking presence though he doesn’t appear until curtain call. Director Kelley Weber has tied it all together in a package that looks remarkable and sounds as Gothic as Mary Shelley’s works. The clever set design by David Blake consists of three-deep walls of diagonal wooden slats that rise above each other as they move toward backstage. Built in is a large scrim on stage left reserved mainly for the monster appearances and a smaller scrim stage right to accommodate Mary’s mother as she sits on a stool and chats. With Bess Moynihan’s striking lighting design, the effects become even more dramatic. Add the wonderful video design by Michael B. Perkins that travel over the wooden planks, the scrims and on a small easel and you’re treated to a show that is as visually stunning as it is remarkably acted. Ellie Schwetye also provides a wonderful sound design to flesh it all out. 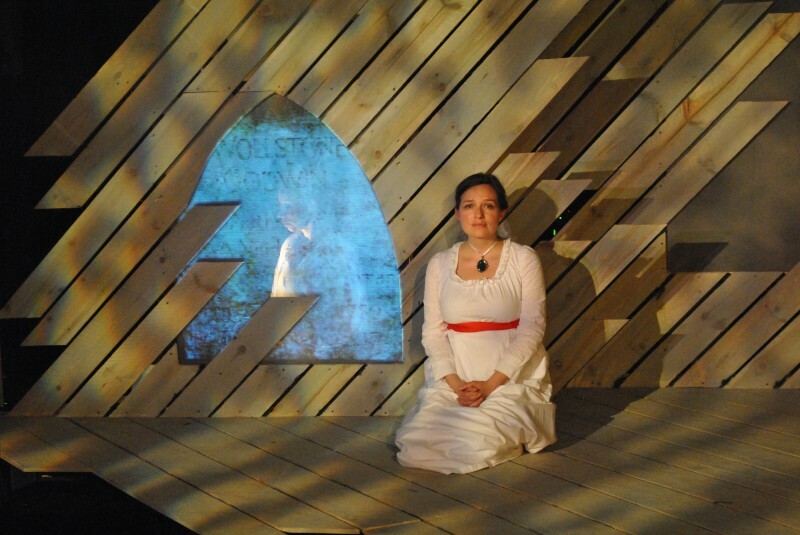 “Mary Shelley Monster Show” is a wonderful, creative piece of theatre. It truly captures the essence of her time and the bizarre life she must have led. SATE, the Slightly Askew Theatre Ensemble, presents it on stage through August 30th. Give them a call at 314-827-5760 or at slightlyoff.org for tickets or more information.